People would speak in hushed voices about the 'studies' at the Lewis Institute. The fact is, they had no idea.. The Institute is an immense building towering over other buildings in the area. Guards patrol a walkway on the roof and in the grounds around the building. 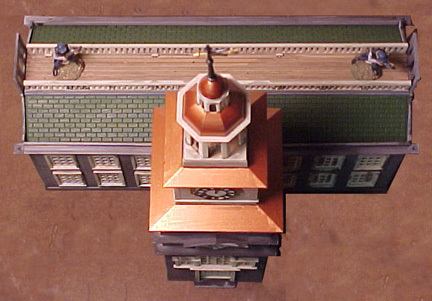 The building is the Plasticville Kit called 'City Hall'. It is an imposing structure, both tall and wide, although not especially deep. It makes a fine Government building, Institute, or University building. Miskatonic U. anyone? 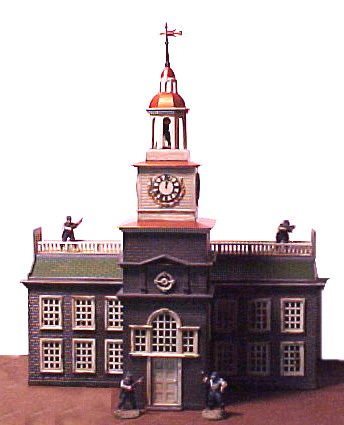 The building is moulded in several colours, is designed to be snap-fit together, and can be assembled into a decent-looking kit without painting. All doors and windows snap into place, so can be painted separately from the walls, making the end results easy, quick, and neat. The front and rear doors open and close. 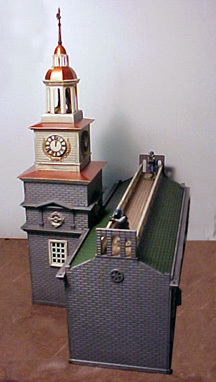 O scale buildings are usually a bit crude, but this kit is not. The architectural details are well-done and convincing. 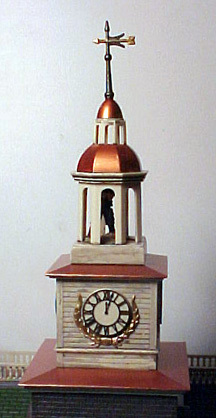 The clock and wreath come prepainted. There is room in the tower for a sniper, although you have to insert a floor. Don't place it at the base of the open area as I did, place it level with the lower edge of the square section supporting the cupola. I'll be lowering mine to give a sniper more room. I left the cupola roof and cupola unattached, so I could have access to the cupola and tower interiors, and for ease of storage. The building is tall. The walkway and tower make good observation or sniping positions, and provide some interesting tactical possibilities. The roof walk was an attractive feature of this kit. It is perfectly-sized for my figures, as I use the superior 20mm bases, which ascually fit into reasonable spaces. 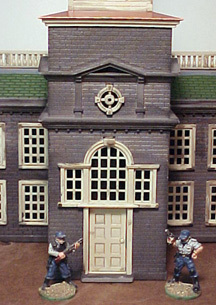 If you are using 25mm bases, you'll have to remove the locating lugs from the railings and attach them to the top of the walkway edges, and fill the enormous locating holes. As you can see. although imposing, it is not very deep at all. Its square-inch footprint probably isn't any bigger than the Police Station. 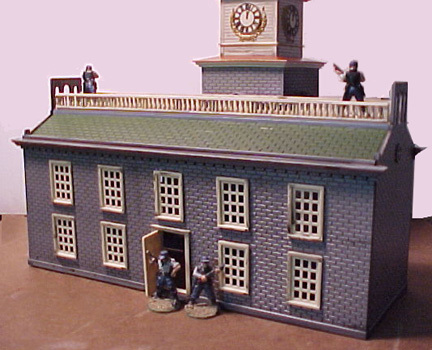 The building is a joy to build, with far better fit than the usual Plasticville kit: The separate doors , windows, and trim make assembly and painting a joy, and the detail work makes the kit visually appealing. The opening and closing doors are a nice touch, and any pieces you want to leave removable fit securely without glue.